Two of the babies taking a rest after a long yoga session. 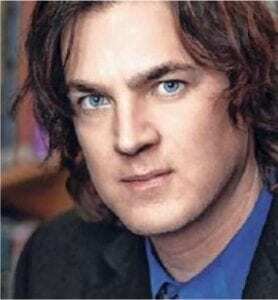 Photo credit: Joe Canfield. As I went into child’s pose, two baby goats leapt onto my back. I’d never done yoga before, let alone in a public place. But none of that seemed to matter as I toppled to the ground in laughter, the baby goat now in my arms, no longer on top of me. Deep in Wickersham, Washington, Goat Boat Farm offers a yoga class unlike any other. It’s filled with furry friends, memorable moments and, if you’re lucky, multiple goat kisses. Nicole and John Paulson run the farm located South of Lake Whatcom, and the lush landscape is the perfect spot to unwind and relax for an hour. 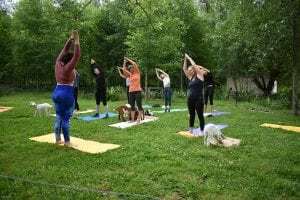 Yoga instructor Heather Williams teaches the weekday goat yoga class at Goat Boat Farm. Photo credit: Joe Canfield. The couple purchased the 15-acre property with the intent to grow flowers commercially. Soon after their purchase, they realized a few living lawn mowers would help clear the hordes of blackberry bushes in their way. 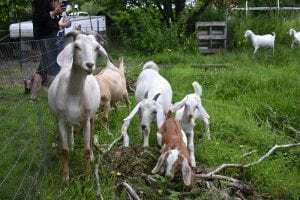 After purchasing their first goat, Molly, the logical choice was to add a few more and get their acreage cleared and ready to plant. 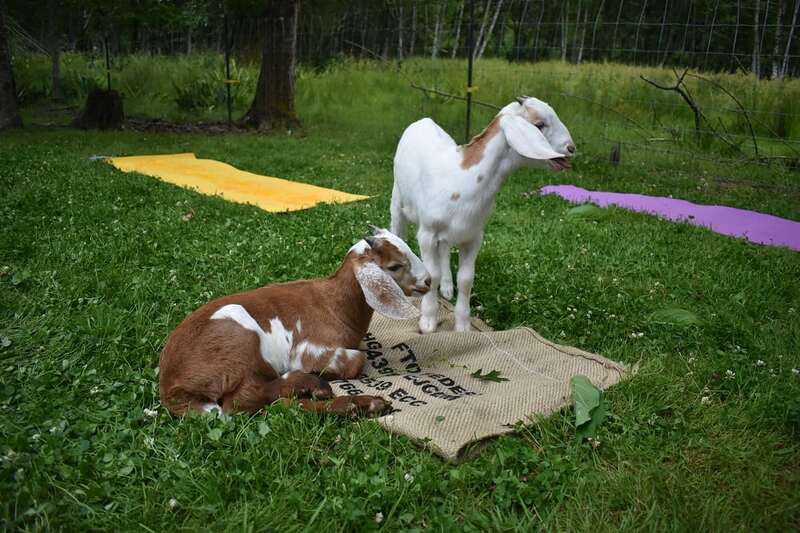 Last year, Nicole partnered with friend and local yogi, Stormie, to offer goat yoga classes. The farm had been cleared of blackberry bramble and she was looking for a new way to use the goats; one that didn’t involve commercial dairy farming. Molly is the goat grandma. All goats on the farm are her direct descendants and her grandbabies are the ones you’ll play with in class. Or maybe I should say the ones who will be playing with you. The goats have a tendency to, well … be goats. They’ll jump on you, hang out next to you, lightly chew your hair and may even launch a baby goat sneeze or two in your direction. Don’t fret, the goats that attend class are too young to have teeth or big horns, so they can’t do you any substantial harm. Baby goats ready to get their yoga on at Goat Boat Farm. Photo credit: Joe Canfield. Nicole tends to the goats during class. It’s convenient because if you feel like they’re getting too aggressive or you’ve had enough goat time, Nicole will come by and shoo the little ones along. Don’t worry, they’ll happily find a new friend or two. Yin yoga is taught at the classes. When Stormie isn’t teaching, local Bellingham yoga instructor Heather Williams instructs the class. Heather completed her 200 hours of yoga training at the Soma Yoga Institute in Hawaii and teaches yoga at Fitness Evolution in Bellingham. Heather led the class I attended. She was once where I was – a goat yoga first-timer, eager to pet all the goats and engage in all the yoga poses. Last year, Heather attended multiple goat yoga sessions and decided to stay in touch with Nicole. One year later, she’s filling in for Stormie. Heather led our class with unparalleled patience and focused direction, despite the goats jumping on her, walking on top of her and roaming her general area. Just as it is for the students, it’s all part of the fun for Heather. The goats’ presence enhances the restorative experience of the class; it doesn’t undermine it. There’s something carefree about the whole idea. The introduction of the little animals allows people to lose their inhibition, discard their nervousness and leave self-conscious thoughts at the gate. As stated, I never imagined I would practice yoga around other people, but the combination of the environment and relaxed pace of the class allowed me to get out of my comfort zone. 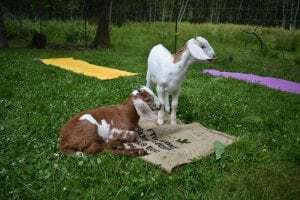 Throughout the summer, regular goat yoga classes run every Thursday. They cost $20 and are limited to 10 to 15 participants per class. Weekend sessions last around three hours and include a formal baby goat introduction, tour of the flower farm, the normal hour-long yoga session and a locally-sourced farm lunch. Both weekend and weekday sessions allow plenty of time after class to take pictures with the goats. Toward the end of the session, the babies started to get anxious and the bleating began. The mothers called across the farm in a hearty response. And then, perhaps the most exciting part of the whole experience happened; Nicole reunited the babies with their mamas. After class members’ photo-ops were over, she opened a gate at the other end of the farm and the mothers marched out to fetch their young, anxious to bring them home. Goat yoga may make happy goats, but it makes even happier humans.